Let us assist you, with our expertise. We believe in quality service and are committed to ensuring that your gate operates optimally at all times. We not only offer service and support but also advice on all your gate automation and intercom needs. We are the leaders in our field. Installations and repairs are carried out professionally according to manufacturer's regulations. Installation, repairs and servicing of all makes of gate motors and intercom systems. We refurbish motors, do upgrades and supply remote controls. We work on both swing and slide gates, using only the best products on the market. 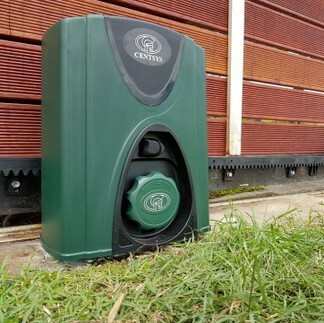 We are also able to fit your motor with a battery backup system to ensure that your gate will operate during a power failure, providing you with the best electric gate motor for your needs. 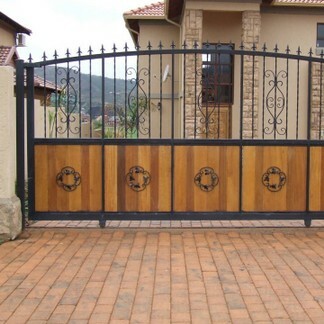 We specialise in Nice Hansa and Centurion heavy duty and normal swing and slide gates. Popular motors include Robus 250 & 500, Speedo Heavy Duty, Run 2500l, Tub, Deluxe 1 & 2, Toona 5/7 Wingo, Walky, Hyke, Metroplex and Elite models, Centurion D5, D10, Vector and R series range. The D3 model is no longer manufactured, but can still be serviced and repaired. However, we generally recommend replacing them. Both Nice Hansa and Centurion motors are supplied by local companies in South Africa that have been in the industry for many years. The motors are reliable, fast and will offer you many years of operation. It is important that a reliable, high quality motor is used, and that spares and parts are readily available. Other factors to consider are battery backup, speed, safety and convenience during a power failure. We carry a large and comprehensive range of spares for both Nice Hansa and Centurion gate motors enabling us to give our clients service 24/7 365 days a year including over the Christmas period when the factories shut down. Because you are dealing with mechanical equipment, things can go wrong over time. Machinery parts wear and can fail. For this reason, make sure that you use a reputable, reliable company with the expertise to meet your requirements. We offer support for your gate automation needs. Our professional, skilled teams are at your service 24/7 to help with any garage motor, remote gate, motor repair or any other service related to Gate Motors and Intercoms. We operate within a network of associates throughout South Africa who are able to help you with any repairs, new motors, CCTV and other security needs. Please send us an email and we will get the closest company to contact you for Gate Motors and Intercom Repairs or Quotes on New Installations. Most automatic gates driveway gate operators used for integrated security systems access control are of the slide variety. They work on an electric motor either AC or DC which turn through an oil cooled reduction gearbox giving power to the drive cog which drives the gate on a steel rack. The power of the automatic gate motors is determined by the RPM and reduction ratio of the gear box. Swing motors work on the same RPM and gear ratio idea, but most work on a ring gear formula as opposed to a oil reduction box. The gear turns onto a drive shaft which then pulls an arm attached to the gate via a universal joint. The piston system is also popular with swing gates, but are slower. These work on a worm gear. 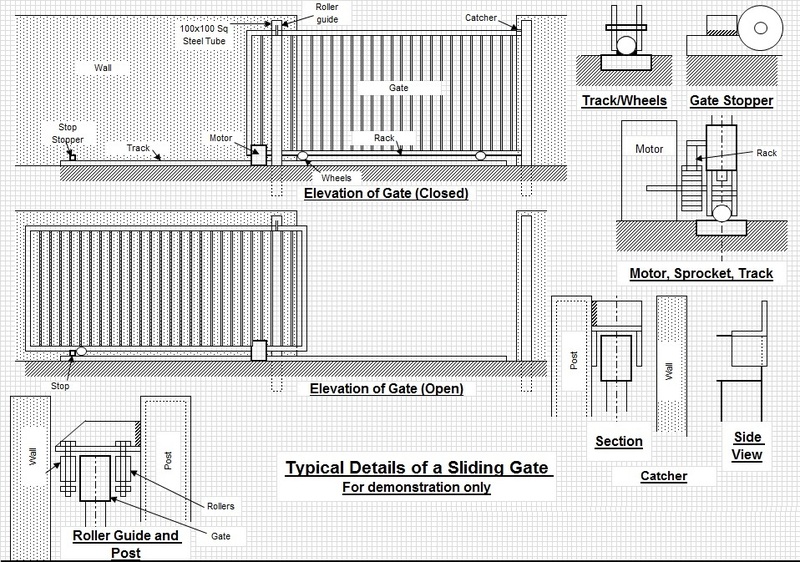 To see a simple schematic of how a sliding gate works click on the link below. 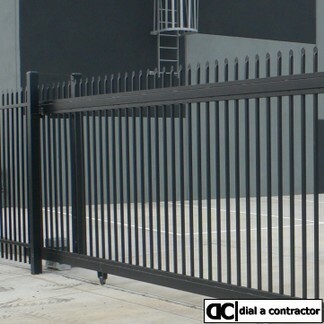 We will fix your gate quickly and effectively. Our service division will service and repair your gate motor and intercom within 24 hours. 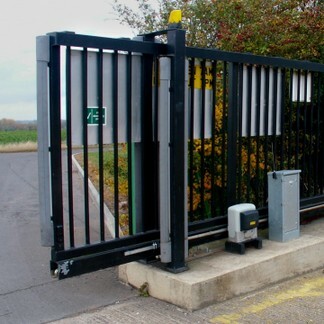 Our company philosophy is that automatic gates are no longer a luxury but an integral part of your security system, consequently we strive to get your gate operating as quickly as possible. 95% of the time we will have your gate up and running within 24 hours or sooner. Your automatic gate repair is in good hands with us. In most cases we will be able to fix your gate and/or motor on site. If you need a gate and fence repair we can do this as well. We can also repair the gate and repair the gate latch on site for our clients. We do city gate motor repairs on motors and can supply equipment for electric farm gates. Gate repairs and automatic gate repairs are our speciality. If you or a guest crashes into your driveway gate, call us, we will be able to help you repair it. Crashing into your gate can push the gate off the rails or make it fall over. This can cause damage to the gate motor as well as the gate. We can install electric security gates and motors for you. We use only the best products on the market. We will refurbish motors, do upgrades and supply remote controls. We work on both swing and slide gates. You can also contact us if you just want us to supply you with the equipment only. It is important that a reliable, good quality motor is used, one that has spares and parts readily available. Other factors to consider are battery backup, speed, safety and convenience during a power failure. We also recommend retaining walls to keep mud off the track. When you install a gate, you may as well install electric gates while you are about it. 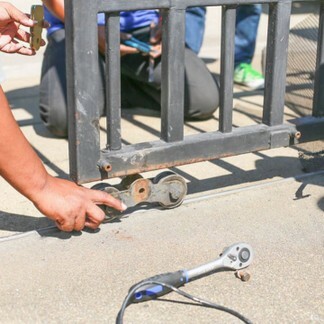 When you have gates and motors installed, make sure your gate installers give back up service. We have completed thousands of gate installations, and as other gate installers come and go, we remain in order to give our clients the best service possible. We install, repair and service all makes of gate motors and intercom systems. We will refurbish motors, do upgrades and supply remote controls. We work on both swing and slide gates. We use only the best products on the market. We will also change your motor to battery backup. Centurion D5, D10, Vector and R series range. We supply a range of garden gates, entrance gates, driveway gates and any type of gate that you may require. 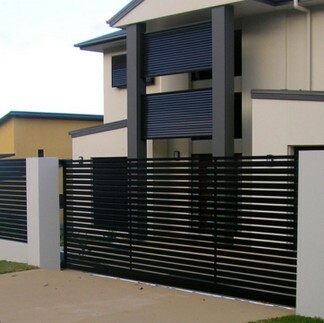 Pedestrian gates for home security access are provided within or next to the driveway entrance gate and/or barrier gate and are necessary for staff or child access, and for use in an emergency such as a power failure. 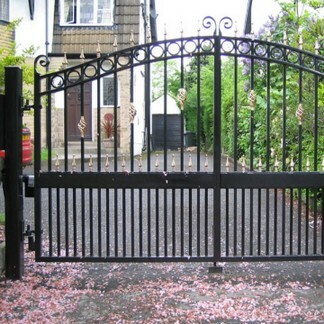 These gates can be made from different materials such as driveway gates in wrought iron and custom wood driveway gates. Make sure that you select the best option for your driveway gate. A swing gate works better in certain situations. Slide driveway gates are most popular and are used most often. It is important that the gate is made from quality materials and that it is not too flimsy. If the gate is very large and heavy it will require a heavy duty motor. There are a variety of designs which can be made to order. See some examples, Page 1 and Page2. We can make wooden garden gates for drive-through electric gates to any size or specification suited for your driveway. These wooden driveway gates are made to order so that you can be certain of getting a perfect fit for your requirements. 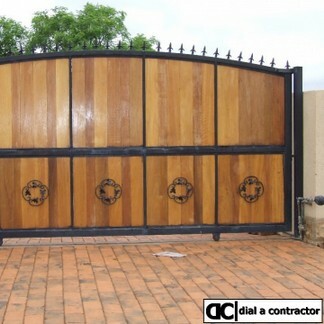 Custom wood driveway gates are made to suit all tastes and budgets. If your driveway entrance is wide you will need a wide wooden driveway gate to be specially made as this is not standard. 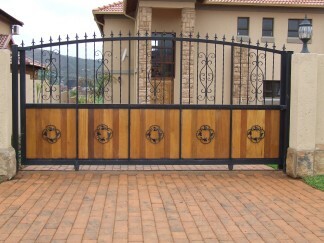 There is a varied selection of styles of wooden gates. 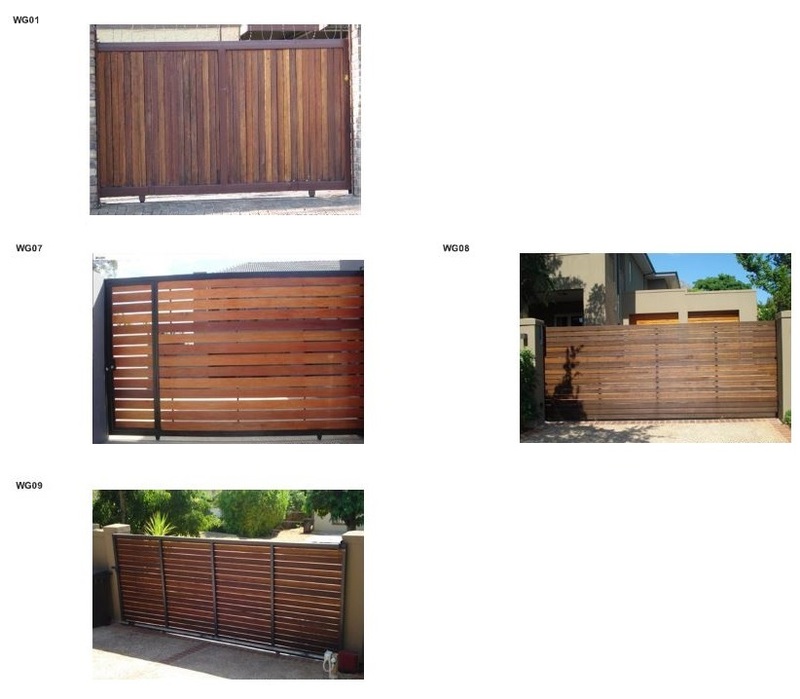 Solid wooden gates provide privacy as people cannot see through the automated electric gate. See some examples. There are a wide selection or ornamental designs or decorative designs for steel sliding front gates and driveway metal gates. These can be sliding wrought iron gates, driveway iron gates and driveway gates in wrought iron. We can design and manufacture any style in aluminum or wrought iron metals. Gate designs for automatic gates should have an emphasis on innovative design. Unique design, custom driveway metal gates can be designed with styles to fit every taste. See some examples. The ability to see what is happening around your property is essential for your family's safety. It gives you the chance to take action before you are confronted by trespassers or intruders. The images are also recorded so that you can see any activity that has taken place over the previous seven days. This helps to identify who may have been on your property. These systems are becoming standard in many domestic homes as well in business premises. Security cameras and video systems are getting cheaper. Price will depend on the quality of the equipment. There are many different quality levels to choose from. You will require a higher quality camera if you want clear pictures in order to see details such as face or number plate recognition. These cameras are high resolution and are some of the best quality cameras on the market. Most people select larger monitors and have all camera feeds showing on the monitor. The cameras are left on all the time. It is better to keep video systems separate from your voice intercom system. Video surveillance systems add a great deal to your emotional security. You will feel more secure if you are able to see what is going on around your property. Try putting a few more cameras around your gate, both inside and outside. Make sure you cover your most vulnerable spots. A picture outside on the pavement will also help alert you to any strangers lurking about, waiting to attack you as you leave or enter the property. 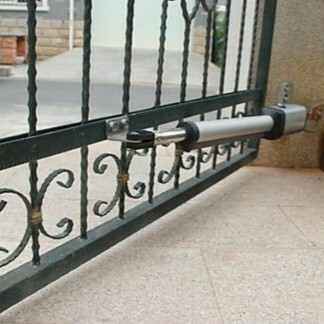 They will also by showing you if the gate is open or closed, again to helping to prevent easy access to your property. Always use an established contractor that will have spare cameras etc in case of lightning strikes or other problems. Be as safe as you can be and use surveillance systems to help keep intruders out. If potential intruders know that you may be watching them, the chances are they will not attempt to break in. Remote access security cameras and video intercoms are becoming more of a necessity than a luxury as crime increases. Garage door automation goes hand in hand with gate automation and is needed to complete any home access and security system. Garage door access security is also convenient. We use quality machines with, battery backups and gate remotes. Garage door gate control access, security access doors and gates will secure your home and give you peace of mind. You can operate both your gate and garage door from the same remote. Having more than one remote on your key ring is very bulky and inconvenient. You can use any remote with any garage door motor. Most new systems use code hopping remotes as they are more secure, but the old type can still be used as well. You may also want to put infra-red safety beams on your garage doors if you want the added safety of the door not closing on your car. Most wall modules these days are wireless and can be used from any place in the garage. The wall module is used to open the garage door from inside the garage. It can also be used to lock the system so that it will not work. This is used if you have a child who is playing with the system and you want to stop them. They can be carried in the car or can be placed in the house as no wires are needed. Garage doors must be in good working order for the garage door motor to work properly. If the door is not properly balanced and serviced, the motor may give problems. Before you fit a motor make sure that the door itself is working well. We keep most parts for the Nice Hansa motors in stock and supply gate automation equipment, automated gate parts, electric gate parts and driveway fence gate hardware. The V profile wheel is required for the v track for sliding gates. When you install wheels on a gate make sure that they are double bearing wheels. Sliding gate wheels come in different sizes. Call us to install or replace your driveway gate wheels. Anti theft brackets are an essential part of an automatic gate installation as the theft of gate motors increase. The bracket will act as a deterrent against this theft. Infra red safety beams or a driveway gate sensor is necessary to prevent accidental closing of a gate onto a car or person. We supply a security access keypad that can be wired your electric gate. It is important that your gate and garage motors function at all times, even during power failures, especially since 80% of hijackings occur in driveways. This is why it is so important to choose the best electric motor for your needs. Nice Hansa as well as Centurion gate motors offer a variety of auto gates, including the D5 gate motor, with the battery backup feature. The battery back up will ensure uninterrupted power supply. Battery back-up is essential to ensure your gate and/or garage motor will work in the event of a power failure, or if thieves switch your power off with the intention of attacking you when you get out of your car to open the gates. Many older motors do not have battery backup. Contact us to replace old 220 volt motors that will not work during a power failure with battery backup technology that will continue working. Your life may depend on it. Don't wait until it is too late. Contact the most reliable Automatic Gate Repair company around today. This access security warning is a device that will trigger a siren if the gate stays open for more than a predetermined amount of time. These wireless driveway alarms will ensure that you are alerted if your gate is left open. There have been reports of gate motors being stolen. These alarms are also beneficial in letting you know if your motor has been stolen. If this happens, the alarm will warn you that your gate is open so that you can react immediately and ensure that your property is not vulnerable. Increasing crime has meant that the entry and exit point of your property is your most vulnerable area. You need to ensure that you have an effective remote access security solution and a warning system should this occur. Get a gate alarm, give us a call today! South Africas number 1 residential and commercial contractor for replacing of gate motors. Leading Residential and commercial contractor for replacing of gate motors. Leading provider of Residential and commercial gate motors services. Local Residential and commercial contractor for replacing of gate motors. Specialised Residential and commercial contractor for replacing of gate motors. Africa’s leading Residential and commercial contractor for replacing of gate motors.